Sean Wolf grew up working at Wisconsin-based Wolf Paving, which was founded by his grandfather in 1941. Today, Sean is vice president of the company. Sean started out emptying garbage cans and performing other low-level tasks for the company before he could drive. Ultimately, he worked his way up through the ranks by running every piece of equipment in the company. “I think I was cheap labor,” Shawn recalled with a laugh. His brother, Devin, who is somewhat younger, followed the same path. Sean has a degree in marketing and his brother’s degree is in finance. Both men and their education are now integral to the company. When Sean’s father came on board he helped expand the company into asphalt paving. Today, as its current name would suggest, that is the main focus of Wolf Paving. With asphalt paving comes a lot of maintenance and preparation work, though, so in more recent times the company has become active in the sweeping business, as well. Currently, the company focuses its sweeping activity in the municipal and commercial arenas, along with self-performing any sweeping needed for its paving and seal-coating operations. In addition to providing sweeping services to existing parking lots the company also does a significant amount of new construction and commercial work. Their team also handles sweeping at some of the big box stores, as well as the additional pavement maintenance that goes along with it. Being located in Wisconsin, the cleanup of winter snow abatement products can be considerable. However, in recent years, more emphasis has been put toward alternatives to the sand and similar materials used historically. For example, some waste products derived from the area’s beet and cheese production are now being utilized in place of sand. 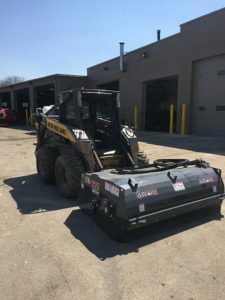 Not surprisingly, the company initially entered the sweeping business as a result of needing sweepers as support vehicles for its paving operation. As the firm grew, sweeping was seen as a natural add-on as an additional in-house profit center, rather than continuing to subcontract out any needed sweeping work. “We realized that sweeping was another market that we should be in,” said Sean. “However, much of the work we do can be accomplished via mechanical brooms, like Broce angle brooms and skid steer box and pickup brooms. Those are the machines we are most likely to have on our paving operations. We also have some sweepers that are mounted into pickup trucks. In addition, we run some larger-size Tennant air sweepers. “We utilize our angle brooms to clean the side of the roadway as a component of our milling jobs as well as for some of our contract work. For milling, we often push material to the side of the road where we can access it later for reuse. We broom it out onto the shoulder and then, when we come back with the shouldering machine, the material is already there and gets graded out. This makes more sense than picking the stuff up, hauling it away and then having to bring it back. With the angle broom sweepers we can keep as much material as possible onsite, yet available for later reuse. There are several locations Wolf Paving handles where, due to environmental restrictions, no salt whatsoever is allowed to be applied in the winter. Instead, a significant amount of sand is spread. Much of the time, Wolf Paving initially provides the client with the sand and then comes back in the spring and sweeps the material up. The collected sand is taken back to the company’s wash plant where it is re-washed and available for reuse the next year once it has been blended with new, virgin, sand. The company operates quarries for mining the sand and other aggregate material it utilizes as well as has an asphalt plant in support of its paving operations. When at full operational capacity in the summer, Wolf Paving employs about 120 people. The company’s sales personnel combine selling sweeping services with selling paving and the other asphalt-based services that Wolf Paving offers. 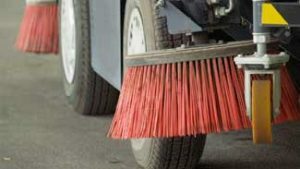 However, one salesperson is dedicated to selling municipal sweeping service contracts, as well as big-box store and other types of parking lots. The company’s market area extends a total of 75 miles in the north-south direction and nearly 100 miles east-west. Although environmental restrictions and guidelines don’t appear to be as strong in Wisconsin as they are in nearby Minnesota, the City of Milwaukee has a combined sewer system and, as a result, there are many more regulations in that area. “In the Milwaukee area, especially, we are seeing a lot more porous pavement,” Sean said. “This has implications for both our paving and our sweeping departments. The City of Milwaukee is trying to alleviate some of its storm water runoff pollution problems. One of the best ways to do that is to allow the pollutants to infiltrate through the pavement and into the ground. However, porous pavement brings a whole new set of maintenance requirements. “Porous pavement requires a regular sweeping schedule with, ideally, vacuum sweepers. Air sweeping is done on a preventive basis to keep the drainage holes through the asphalt open. This has provided us with an uptick in sweeping in Milwaukee and Milwaukee County for environmental reasons. In those areas managers want water to recharge through the ground rather than running off to the lake. 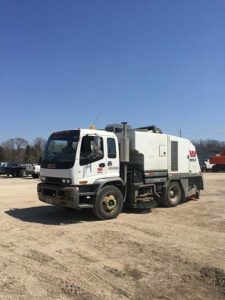 “Porous asphalt can be somewhat sensitive, which is why our lab guys like to see the full force of a vacuum sweeper being used on porous pavement with no kind of agitation on the surface at all. They don’t want to see anything being broken loose on the pavement by a broom. The frequency of sweeping that Wolf Paving’s management professionals recommend as being needed on porous pavement is a minimum of about twice-a-month. If the frequency goes much beyond that, it becomes increasingly difficult for the sweeper to handle the job and a much longer — i.e., much slower — sweeping process has to be done in order to maintain the integrity of the porous pavement. One reason that ongoing maintenance is so important is that porous pavement is difficult to repair unless the prior surface is removed first. If there is a bad area or a pothole, the entire section needs to be cut out and replaced with fresh porous. This is yet another reason why a frequent scheduled maintenance via air sweeping is so critical. With the strengthening economy and lower unemployment numbers, good workers are getting more difficult to obtain. Sean says in this respect Wolf Paving is very fortunate. Over 20% of its workforce has been with them for over 20 years, an relatively unheard-of statistic in this industry. “When we’ve needed more personnel, we have been fortunate to find the good quality people we needed. Fortunately, we have an excellent retention rate. We do have in place an employee referral program to help find our employees, as needed. That seems to work very well for us. Our current employees earn a fairly large bonus for referring a new employee to us, but the new employee has to stay with us for 90 days before the bonus is paid. Wolf Paving operates an extensive and strict safety program, following all state and local codes. They also implement a thorough work zone safety protocol and follow the MUTC book as far as work zone safety goes. Wolf Paving’s fleet is GPS equipped, for both location and dispatch purposes. Plus, if a customer has a question about when or if Wolf’s equipment was onsite it can be answered conclusively. A member of the company management team gets alerts for speed deviations, idle times and prolonged stops. Some of the units additionally have a geo-grid fencing alert so management knows they haven’t strayed out of an appropriate work area. 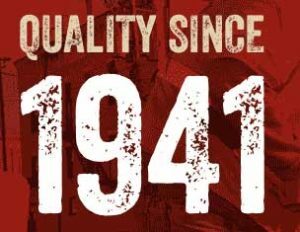 When asked what he sees as the primary reason Wolf Paving has been able to prosper for 75 years, Sean Wolf was quick to answer: “I give a lot of credit to our employees. We have many long-term employees. In addition to our 20% that have been here over 20 years, we have a number who have been here 30 years and even some who have worked for us for 40 years. You may reach Sean Wolf via email sent to SeanW@wolfpaving.com or through the company’s website, WolfPaving.com.